With four weeks until the madness begins, where do local men's college basketball teams fit into the NCAA Tournament picture. There is no shortage of experts using modeling to try to predict the NCAA Tournament field every March. But with the powers that be ditching RPI for a new measuring tool, we’ve tinkered with our own model to try to predict where all our local teams sit exactly four weeks before the first full day of action begins. Remember, this isn’t a prediction of where they will finish at season’s end — it’s where they are right now, with the final stretch of league play and the conference tournaments still to come. With only one senior rotation player, American (13-13, 7-8 Patriot League) is probably still a year away, after dropping four of their last five. George Mason (15-11, 9-4 Atlantic 10) shook off a brutal start and can still secure a crucial top 4 seed in the volatile A-10 Tournament, giving them a double-bye into the quarterfinals. GW (8-18, 4-9 A-10) has only managed consecutive wins once all year and would need a miracle run in Brooklyn. Even after a needed upset of Villanova Wednesday night, the Hoyas are still well off the bubble. They likely need a 4-1 finish (against a slate that includes a trip to Marquette) and a strong conference tournament showing to hear their school called on Selection Sunday. Howard (12-15, 6-6 MEAC) can score, but sports a bottom 15 defense in the country. They’ll need to get more stops to run the table for a winning record, much less a tournament berth. Navy is 8-3 when they score 70 or more points. The fact that the Midshipmen are 9-16 overall shows how much they’ve struggled to do so. 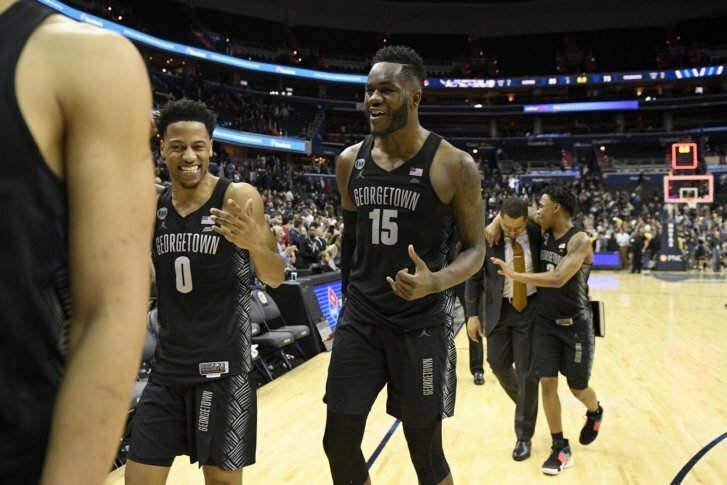 Richmond (11-15, 5-8 A-10) will get a second chance in the A-10 Tournament, but will need more second chance opportunities to make a run — the Spiders are dead last in the nation in offensive rebounding percentage.